•DIMENSIONS: 8" X 8", 8" X 16", 16" X 16", 16" X 24"
A well-designed outdoor landscape creates a welcoming environment for everyone. Make the right first impression with the help of SNS Pavers. As an expert in landscape and hardscape architecture, we have been transforming property fronts and backyards from drab to stunning for over a decade. 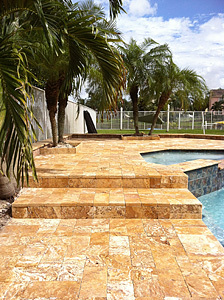 Our difference from other companies in Florida is that we see landscape design both as craft and art. This is how we are able to produce stunning landscapes and hardscapes that homeowners are able to enjoy for years. 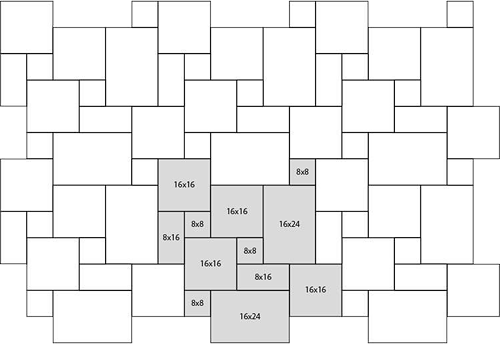 SNS Pavers specialize in customizing outdoor design. We are able to achieve this with the talents and the skills of our hardscape designers and installers. It also matters that we have all kinds of paver materials available to help us create the landscape you dream of. From concrete, bricks to natural stones like travertine, we have them all. If you're looking for an earthy, natural look for your home, then consider using travertine pavers. In addition to its obvious beauty and unique look, it offers many other benefits. Cool to touch – No matter how hot the day goes, this stone remains cool to touch. This makes the material a great choice for building pool decks, where people are most likely to walk barefoot. Nonskid surface – This stone actually increases traction when wet, which is another compelling reason to use it around pools, as well as in driveways and walkways. Minimal cleanup – Unlike concrete and brick pavers, travertine pavers do not produce chalky white deposit on the surface known as efflorescence. 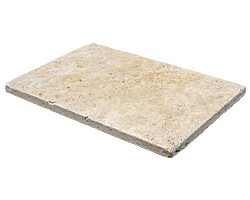 Durable – Your hardscapes will last for years because travertine can withstand freeze-thaw cycles, as well as regular use. Doesn't fade – A thing of beauty is a joy forever, and that perfectly describes this natural stone. Unique – No two stone pieces are the same; no other home will have the same paved surface as yours. Our goal is to create the outdoor architecture that complements the rest of your property and also brings your aesthetic vision to life. This is why we have gathered travertine pavers in all kinds of colors and finishes, ranging from neutral colors, such as beige, ivory, and walnut to pink and reddish brown. What gives this stone its particular color is the amount of impurities and iron content it has. 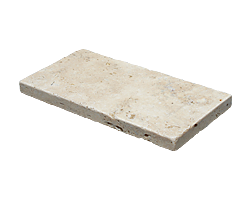 Travertine pavers are also available in different finishes: honed, polished, and tumbled. 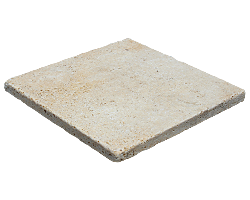 If you prefer a smooth yet matted look, we recommend the honed travertine. If you want a buffed, shiny look, we can use polished ones. Both of them provide a sleek modern look. The tumbled or brushed finish, on the other hand, has rough, textured surface. 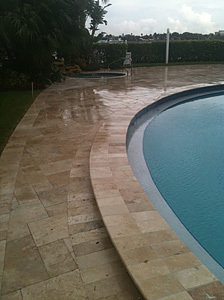 SNS Pavers recommend travertine pavers for those who want to achieve functional beauty for their home. These stones can be used for building driveways, walkways, garden paths, pool decks, and patios. 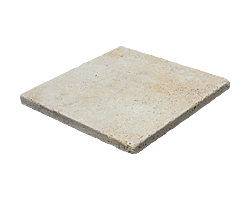 They are also best used in indoor applications, such as countertops, bathrooms, and wall claddings. But the installation of this stone must only be handled by experts like us. Moreover, we source our pavers from the most-trusted names in the stone and paving industry to ensure every project meets the highest standards in paver design and installation.